Glossary contains a list of abbreviations and terms frequently used in Polishcoaldaily publications. Please contact us in case of any other unclear or confusing abbreviations and terms. AGH – Akademia Górniczo Hutnicza, University of Mining and Metallurgy. ARA – Antwerp/Rotterdam/Amsterdam. Major coal importing ports in northwest Europe. ARP – Agencja Rozwoju Przemysłu, Industrial Development Agency. Capesize – a ship of about 80,000+ DWT. A vessel which is too large to transit via the Panama Canal and thus has to sail via the Cape of Good Hope from Pacific to Atlantic and vice versa. CCS – technical term for ‘Carbon Capture and Storage’, the process which aims at capturing and storing CO2. Coking coal – hard coal type having a suitable quality to produce coke (mostly bituminous coal). Coking coal contains 20 to 60% of volatile matters. Fossil fuels – hard coal, lignite, oil and gas. GIG – Główny Instytut Górnictwa, Central Mining Institute. GIPH – Górnicza Izba Przemysłowo-Handlowa, Mining Chamber of Industry and Commerce. GZW – Górnośląskie Zagłębie Węglowe, Upper Silesian Coal Basin. Handymax – inexact term, but normally taken to mean a vessel of about 40-60,000 DWT. Handysize – inexact term, but normally taken to mean a vessel of about 10-40,000 DWT. IGSMiE PAN – Instytut Gospodarki Surowcami Mineralnymi i Energią Polskiej Akademii Nauk, Mineral and Energy Economy Research Institute of the Polish Academy of Sciences. JSW – Jastrzębska Spółka Węglowa, largest coking coal producer in EU, state-owned, based in GZW. KHW – Katowicki Holding Węglowy, third largest hard coal producer in Poland, state-owned, with mines in GZW. KW – Kompania Węglowa, the largest hard coal producer in EU, state-owned, based in GZW. 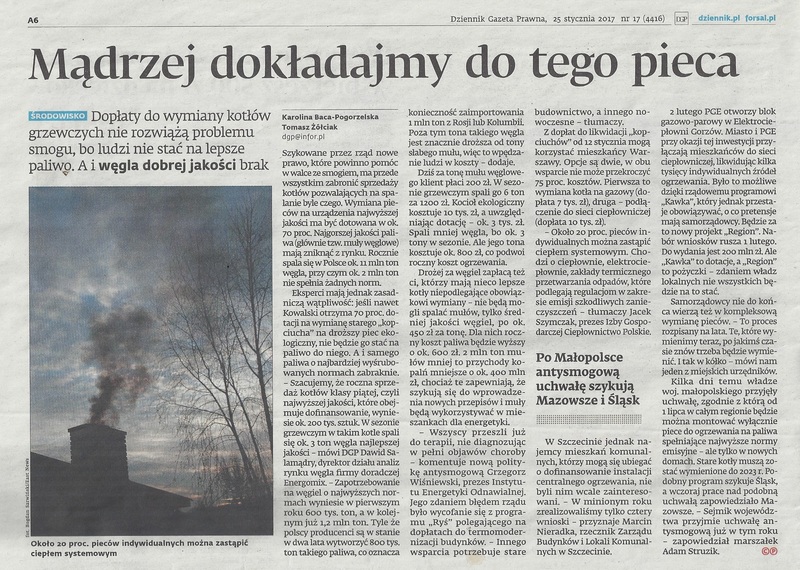 KWK – Kopalnia Węgla Kamiennego, hard coal mine. Lignite – solid fossil fuel of organic origin. Calorific value: 8–12,000 kJ/kg. LWB – Lubelski Węgiel „Bogdanka”, private-owned mine based in LZW. LZW – Lubelskie Zagłębie Węglowe, Lublin Coal Basin. ME – Ministerstwo Energetyki, Ministry of Energy. MSP – Ministerstwo Skarbu Państwa, Ministry of Treasury. NKW – Nowa Kompania Węglowa, new concept of restructuring Kompania Węglowa’s mines to keep them economically viable. PGE – Polska Grupa Energetyczna, energy producer, Polish largest coal consumer. SRK – Spółka Restrukturyzacji Kopalń, Mines Restructuring Company, responsible for liquidation of Polish mines and managing their assets. Steam coal – hard coal type used for power and heat generation. Important characteristic is the calorific value as well as the ash, water and sulphur content.